compositional unity, and design. The challenge in public art is to make the content accessible and understandable to the largest audience, but the greatest responsibility is to honor God and His words through our art. Students began by reading through the word of God in an attempt to pull out a few of God’s promises that are especially meaningful to them at this time of their spiritual growth. We started with Proverbs and Isaiah, but students were not limited to the Old Testament. After two weeks, one student chose Isaiah 60, another chose Psalm 94, and the last chose Ephesians 6. The method of choosing the scripture was a very individual one. The choir had been working on the Latin version of Psalm 94 in one of their choral pieces, so Sara found God’s promise to bring joy to us even in our anxiety very timely. 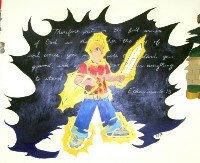 Brian had been working on Super Hero illustrations in his sketchbook assignments, so finding God’s promise to equip us to face adversity seemed very appropriate. Kimi, with her quiet passion for God and His goodness, wants others to share the peace she received from God’s continuous light. and finally He promises never to leave us. This is now an annual event for art students in the Art Methods 3 class. Each year students submit ideas that are voted on by the faculty and staff.